Swags in Australia today, are a little different from what Henry Lawson described in his 1907 poem The Romance of the Swag. In Henry’s days, and before motorised transport it contained the whole kit-and-kaboodle, clothes, bedding and belongings. The swag was carried around from place to place, a home on your back so to speak. Swagology (my invention for the study of swags) can tell you quite a bit about a person. A neatly rolled swag can often mean a neat and tidy person with attention to detail. An unsitely bundle of canvas with blankets hanging out might mean a bloke doesn’t give a toss about much. No doubt you have seen those double swags, with a huge mattress that almost fills the back of a ute… I’ll let you make up your own minds about that! 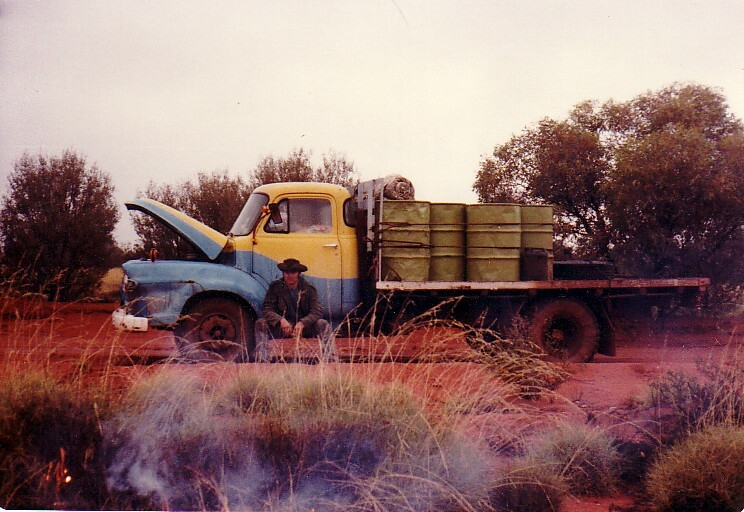 Anway, I digress and the roll on top of the fuel drums on the back of the old Bedford truck has just been rolled up after a few hours sleep on the road. Yes that is right, it was rolled out on the road. 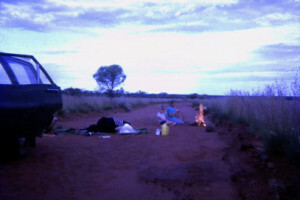 In 1979 when this picture was taken and in remote areas of Australia there were very few vehicles and you could literally camp anywhere, even on the road. For instance, during the 1960s when our family owned Yamarna Station we would often camp on the road in soft sand. When my father became too weary from driving, he would pull up where a creek crossed the road, and we would all pile out and camp in the creek. A sheet of canvas was put down, with a rug to cover the 3 kids and we would all be instantly asleep. The very first thing you do when you roll out of your swag is to light a fire to put the billy on. Mornings in the outback can be pretty chilly and below you see my brother and sister sitting around a cheerful morning fire. Of course, camping on any road today would not be a sensible thing to do! When I think back on my swags, they were pretty modest affairs. A piece of canvas sourced from an old tent or truck tarp, with two blankets and that was it. No soft mattresses in those days! Buying a swag wasn’t really an option, you could buy a sheet of canvas, but made-up commercial products just simply weren’t around. Here is my father sitting on his swag while eating breakfast and looking at a some cattle yards he built all those years ago. No doubt a softer seat by far than sitting on the ground. This one did have a small foam mattress, not the same frugal roll he carried on horseback and when he built the temporary cattle yards you see to the below, in the 1950s. It is amazing that the remnants of these yards can still be seen some 50 years later. 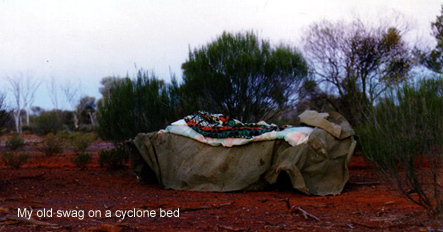 Many years of my early life were spent sleeping under the stars, on a bedroll, or a cyclone bed as a shearer. Your bedding should be rolled up as soon as you climb out of it. Left unrolled any manner of biting animals are likely to find it comfortable too. Not so bad if they are lizards, but scorpions and snakes are generally not welcome bedfellows. My unkempt bundle on the cyclone bed is off the ground, and although untidy, it is unlikely to become filled with ‘nasties’. One should at least pull the canvas over the blankets to keep some of the dust and crap out of it. The current crop of camp bedding has become a real fashion statement, and the variety of style is simply amazing. These days many of are good quality, with a high density foam mattress inside, and a water proof canvas cover enclosing both bedding and the sleeper. Some also have headflaps, and zipped sand-fly proof fine mesh for those hot nights in insect infested locations. My wife’s new canvas hotel has fibre rods to keep the top open, can be pitched, and is more like a small tent. They are perfect for car camping, fishing can be thrown on the back of a ute, for either the quick or long trip out bush. There is no doubt that in Australia’s harsh outback conditions the durability of this bit of kit comes into its own. Years ago blankets were used inside swags, but most people now use sleeping-bags which are more practical, especially when it’s very cold. When the swag is rolled up it is fastened with straps. 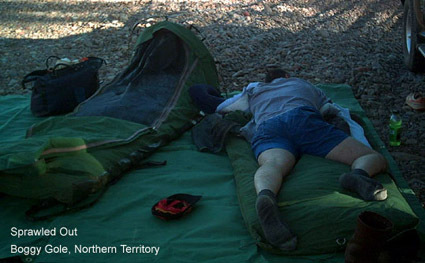 Overall this form of bedding is much heavier and bulkier than a bivvy bag, but they are more comfortable and durable.